Five days after race, I have recovered physically. Emotionally, I am still floating somewhere on Cloud Nine. I thoroughly enjoyed the race, I finished in 3:26:37. That's 9 minutes off my previous Personal Best. In the rankings, my time put me 32nd woman to finish (out of 450 and that included some really fast Kenyans and Ethiopians) and 4th place in my age category of the 35-39 year olds (obviously no Kenyans or Ethiopians in that group). I had trained for a 3:20:00 marathon, but knew all the way, that it might be a tad too ambitious. Part of my training was to run at marathon pace. That pace never felt 100% comfortable. Therefore, I set myself staggered goal times: I needed to go under 3:30. That had to be a must, otherwise I would have been disappointed. I thought that 3:25 would be a realistic. I figured that a 3:20 would be possible when all the stars were aligned. After a surprisingly good night's sleep the night before the marathon, I woke up to find out that there was deep fog outside. One could hardly see beyond 20 metres at times on the way to the race site. We had a few foggy days in the past week. I thought it was quite nice weather to run in. Fog means cool temperature and no wind. Two conditions that I'd very much appreciate during a race. 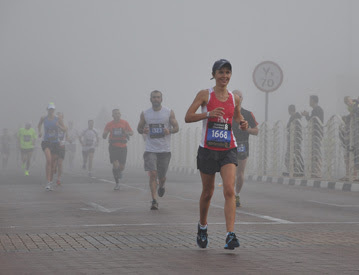 Running a marathon in deep fog - a great surreal experience. I felt great at the start line. My plan was to run negative splits: take it rather easy in the first half of the race, so I'd have some energy left for the second half. My halfway time was 1:44. Now it was time to speed up a bit. In my other two marathons, I followed the same race strategy, and it always worked out well. It makes you overtake other runners when their AND your own energy levels are dwindling. It's a great motivation booster that keeps you going. I felt great up until 39-40k. The last few kms were the longest I have ever run, although they were my fastest in the whole race. I felt completely depleted, and was thinking that I might either faint or throw up after I'd cross the finish line. I crossed the finish line in 3:26:37 (which means I ran the second half in 1:41 - faster than the first half). The next few minutes were a bit of a blur, as I was trying not to faint or to vomit. I had some rehydration drink and a banana wrapped in plastic was given to me. I wasn't even able to remove the plastic and had to ask for help :-) With some liquids and a banana in my system, I was slowly able to pick myself up again. My sister was waiting for me at the finish line, and we walked back to watch my friends on their last metres before their finish. It was great to see so many people finish with a PB, or under 4h for the first time. My stomach couldn't take much food for the first few hours after the race. In fact, I only had an appetite for a coffee which we managed to buy near the finish line. Only after about 5-6 hours I developed an appetite for hearty, savory food (and a few beers and wines too). Once the ice was broken foodwise, I didn't stop eating for another 2-3 days. Little bits and pieces went into my mouth on constant basis. These little quinoa cookies became an integral part of my marathon post-race refueling strategy. It's the first time that I used quinoa flakes which sat in my pantry for ages. 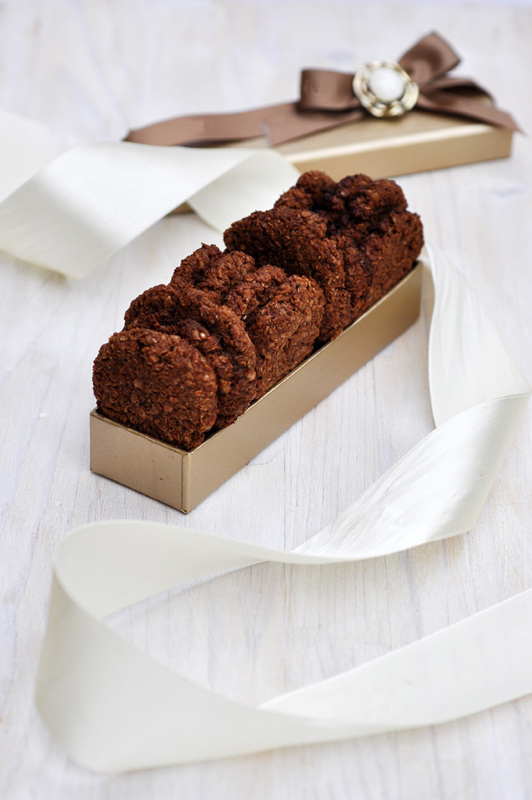 These cookies come out very crispy, just as I like them, full of chocolate flavor with a good hint of coconut. I have made them several times since. They are nut-free too, which means I can pack them into my kids school lunch boxes as a treat. Enjoy! Preheat oven to 180C (350F). Line baking sheet with parchment paper. In a large bowl whisk together together the sugar and coconut oil until light and fluffy. Add in the coconut milk and vanilla and beat until creamy. In a medium bowl, combine quinoa flakes, cocoa powder, salt and baking powder. Pour wet onto dry ingredients and stir until well combined. Fold in coconut flakes. Scoop spoons full of dough and place them on the baking sheet. Flatten them with the back of a spoon or a spatula. Bake for 15 minutes. To make them extra crispy, turn off the heat in the oven. Flip each cookie and leave them in the warm oven for a few more minutes. Let cool completely on wire rack. Keep in airtight container.